One of the best travel purchases I have made is an unlocked high-speed USB 3G modem. It allows me to get broadband-speed internet access for the duration of each trip abroad for a per-trip price comparable to one night of internet access at a hotel, using a locally-purchased pre-paid data SIM at each destination. 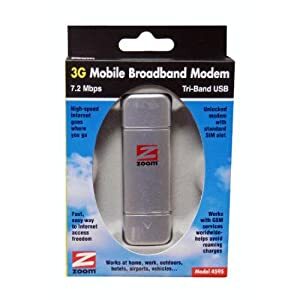 The modem I bought is a Zoom 3G Tri-Band USB Modem (that’s the UK link, looks like it’s also available in the US), and so far I have used it successfully with SIM cards for TIM Italy, Mobistar Belgium and 3 UK. In each case I inserted the SIM, selected the network provider from the software and it worked instantly, usually at the 7Mb HSDPA speeds. There’s simple and easy Windows and Mac software pre-loaded on the stick – I’ve not tried it with the EeePC and Ubuntu yet, I’d be interested to hear from people about their experiences. The SIM card I bought today from Mobistar in Belgium was €15 and gave me 275Mb of bandwidth to use over the next month – more than enough for broadband everywhere at FOSDEM. Until we see the regulators sort out Europe’s mobile market and get rid of the ridiculous avaricious feudalism that blights us, this is a great solution for reducing the cost of getting online everywhere and I recommend it. Update: As you’ll see from the comments, I also use this with a Zoom Travel Router (also available from Amazon in the US). I just plug the USB stick into the router (which is battery powered as well as working with a power supply) and it provides WiFi to multiple devices. It also allows you to connect to a wired ethernet and provides WiFi acces the same way Apple’s Airport Express does. Does the device work with Solaris/Illumos type operating systems? I’ve not tried it; I rarely travel with my Illumos machine. 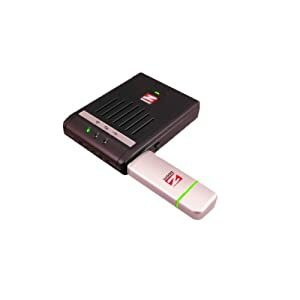 When I do, I use the travel router (see below). Just a comment about your last paragraph from an European moved to US. Before moving I had thoughts similar to yours about the “ridiculous avaricious feudalism” of European carriers. After moving to the US, the European carriers feel “democratic, open and cheap”. At least there you can buy that prepaid local data SIM. Good luck doing that here: you need an expensive 2-years agreement, and probably also their locked-down device. I agree completely, but my specific gripe concerning feudalism is that, despite most of Europe being covered by giant mobile operators, no-one has a Europe-wide service so you’re always subject to roaming charges (especially for data) that are way beyond anything vaguely reasonable. The situation is simply indefensible and exists solely because there’s a cartel co-ordinating everyone subtlety and allowing them to claim various colours of special pleading. @Davide: Not so much of the scepticism! T-Mobile in the US has pre-paid SIMs at prices comparable to Europe. I’d love to have a portable battery powered wi-fi hub I could plug this into. It would be a great hac to get around to the iphone’s overseas costs and support multiple devices with one connection. Yes, it does and I use one – see the Zoom Travel Router that’s designed to work with this USB stick and can run off either its internal batteries or a power supply, I find it works really well, not least for my “other devices” for which there’s no specific driver software. Looks like it’s on Amazon US too.